It’s rare to see wild pythons in southern New South Wales and Victoria. Australia has a lot of pythons, but most species are in the north where it is hot all year round. So, in southern Australia, any python sighting is a very special event, and an important record for science. On a recent Mungo Outback Journey, Wildlife Guide Roger and guests were driving along a red dirt road when they saw a branch blocking the road. Roger started to turn to go around, when he realised the 2 metre-long ‘branch’ was a snake. With great excitement, he pulled over. A snake that big and heavy-bodied could only be one thing: An Inland Carpet Python Morelia spilota metcalfei (also known as Murray Darling Carpet Snake). 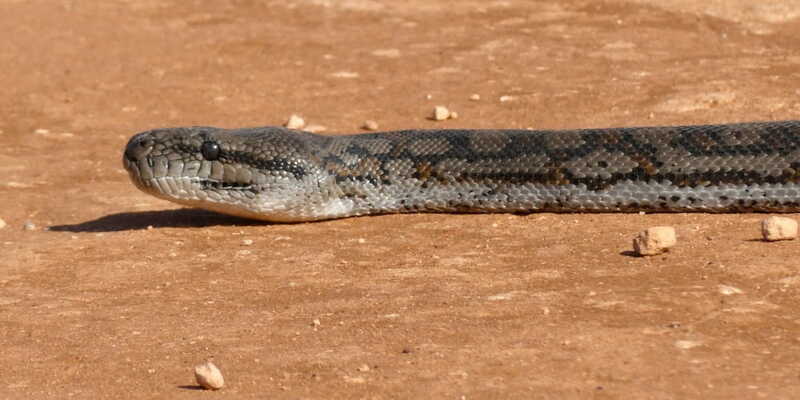 Roger had seen the other subspecies of this snake, the Diamond Python, years before in East Gippsland. But he’d never seen this inland version. As a child of the Mallee, and a regular visitor to the Mildura-Mungo Outback, he knew just how rare this sighting was. Habitat Loss: sadly, on the Mungo Outback Journey we pass many areas that have been recently cleared of their native forest for agriculture. Carpet Pythons are arboreal, and require mature forest to survive. Loss of prey: 18 species of small to medium mammal in the region have been forced to extinction by humans in the last 200 years. The loss of abundance and diversity of prey has had a major affect on the largest native predator in the area. Vehicle Strike: both accidental and deliberate. Some people aim for snakes if they see them on the road, in a misguided attempt to rid the country of “dangerous animals”. It is misguided, because pythons are not venomous, and even venomous snakes pose very little danger to humans. It is also illegal to kill protected wildlife, and all snakes are protected. Foxes and wild dogs: Recent research has found that introduced foxes, in particular, may be hunting and killing mature Inland Carpet Pythons. Quietly, Roger got out of the vehicle and approached the python, encouraging her to get safely off the road. She turned away from him, but started moving towards the parked car. Horrified, Roger ran over to the car to move it well away. If she had taken shelter under the car, or worse, along the warm axles or undercarriage, they might not have been able to get her out. The python continued, very slowly, towards the bushland on the side of the road. Roger and guests watched, relieved. But the drama would not end there. Another vehicle could be heard approaching, at normal Outback speed of 100km per hour. At the slow pace the snake was moving, she was sure to be hit if the driver didn’t avoid her. Roger decided that the best way to protect her was to place himself in front of the snake. Drivers won’t deliberately hit a person. But they might aim for a snake. Luckily the approaching car driver was sympathetic, and slowed down, then carefully drove around. To everyone’s relief, the beautiful Inland Carpet Python finally made it off the road and into the bush. 1. The sheer enjoyment of watching such a magnificent animal. Inland Carpet Pythons are beautiful creatures. They are patterned like a persian carpet in diamonds and hexagons of ochre, silver and charcoal. They glisten in the Outback sunshine. They have a distinct triangular head with a big ‘nose’ and a hint of a smile about their lips. Their big eyes are patterned like a fine net, with a vertical pupil. They are not venomous, but still have teeth, so don’t touch one. 2. To photograph and record the sighting, for the benefit of science and conservation. There are only 5 records of this snake within a 50km radius on CSIRO’s Atlas of Living Australia, and the most recent was 1996. For scientists and land managers trying to protect this species, data is hard to come by and expensive to procure. Roger’s sighting is free, valuable information provided by a wildlife tour operator that could be critical to keeping this rare Australian reptile species alive. If you see an Inland Carpet Python, take a photo and submit your sighting to Atlas of Living Australia or iNaturalist. Always keep the location pin vague – sadly its not only scientists that use these sites, and illegal reptile collectors are a major threat. Echidna Walkabout contributes many sightings of birds, reptiles and mammals to online atlasses for the benefit of conservation. 3. To protect the snake from other vehicles on the road. 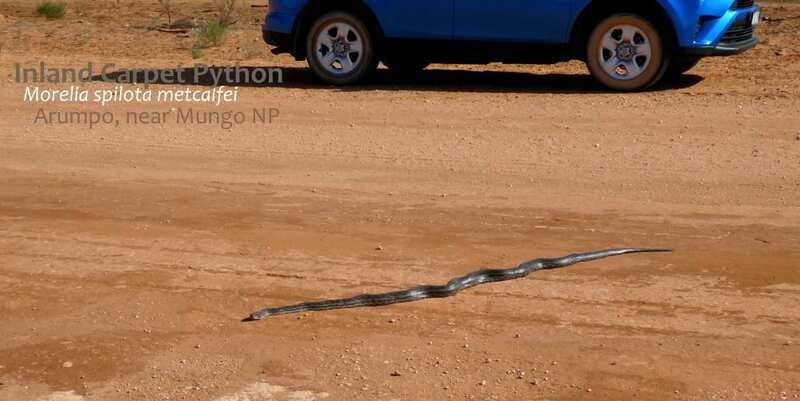 Vehicle strike is a significant threat to carpet pythons – they are slow-moving, and many road travellers simply don’t realise they are a snake. 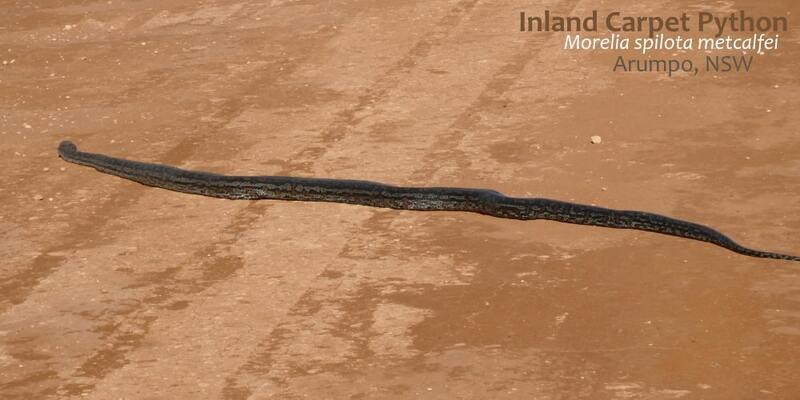 Roadsides in the morning are a warm place for snakes to bask, which puts them at risk. 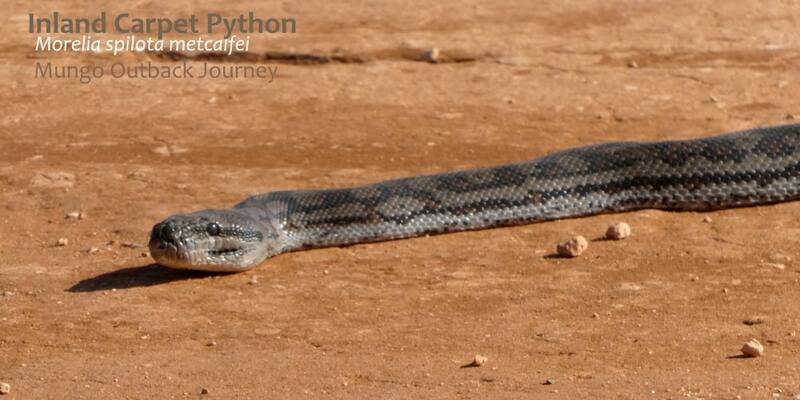 We see many other reptiles on the Mungo Outback Journey! This is a great tour to combine with a visit to the whale sharks in Exmouth, Western Australia or with saltwater crocodiles and Boyd’s Forest Dragon in Far North Queensland.